A good friend’s father passed away yesterday at the well-lived age of 90. Ever since her mom’s passing a couple of years ago her father has been “ready to leave this mortal coil.” He was a good kind man who was loved very much by his daughter and their family. I will always remember her birthday party from a handful of years ago when her Dad and significant other conspired to create a birdhouse painting party. 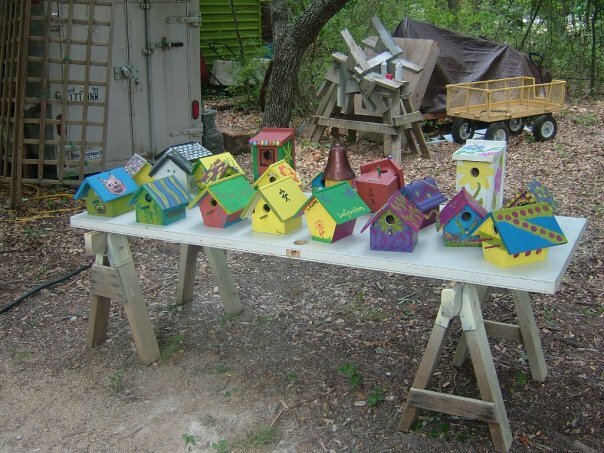 Her father made several simple yet lovely birdhouses for the party participants to decorate and paint which my friend then hung all throughout their xeriscaped gardens. Out of respect and general agreement for her father’s wishes there will be no funeral or memorial service. Somehow this makes me feel a little bit closer to her Dad because although he was such a gentle soul he was also a practical soul and after seeing what his family went through with his wife’s passing he did not want to impose more on them then absolutely necessary with his passing. Sure, if they want to have a remembrance of him during the burgeoning and budding of spring in their garden with the swapping of stories full of wisdom and humor that was fine with him but nothing that cost them money or angst. Thought for the Day: Since birthing, dying and death are all part of the process of life why not discuss these things when we’re coherent and can get clarity about what we think and believe with each other before a stressful experience. There’s nothing as gratifying for loved ones who are in mourning as the ease of finding important documents and the clear understanding of your wishes to say the least about having faced, embraced, discarded or amended core beliefs well before the end. Helpful Hint for Being Human: We ALL experience being born, living and dying so why shy away from what the here and now and what the great beyond means to us now? There is, after all, no time like the present. The first time I really wrestled with mortality and reality was after a weekend of psychedelic imbibing that pretty much burnt away any filters my brain and consciousness came with and any defenses I had created along the way. My response was to dive into intense fear of being alive with constant panic attacks and severe anxiety. Nothing brought me peace, except my big red Golden Retriever who kept a watchful eye on me as my serenity sentry. The blessings from this time were plentiful including getting into some much needed therapy and finally sobriety. 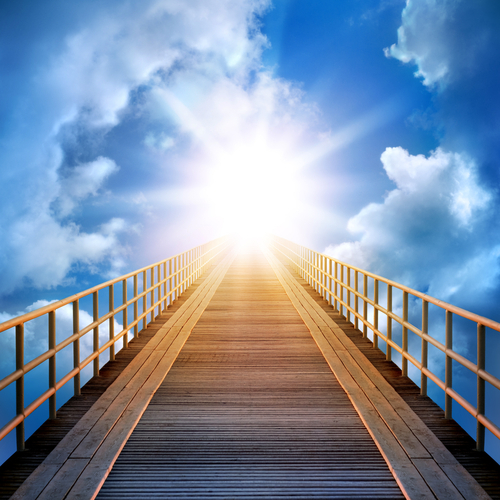 During this journey, I cobbled together a belief system and spiritual path created from many discoveries and learnings which helped me to find peace about death. I believe this acceptance allowed me to be there for others in their time of grief and also for friends who were making their own transition from this life to the next. Two “teachers” come to mind this holiday season as it seems many of us are experiencing a dance with death. One is a friend I’ll call “N”. N and I were part of a group of women (he being the only male) who explored and investigated all kinds of spirituality and psychic worlds. Our whole intent as a group was to learn how to help in healing animals, people and the planet. About a year into our studies, N found out that he had AIDS. We all gathered around him and loved him through the next two years until his passing. I will be forever grateful to N for allowing us to experience his most intimate experience of life in his last years on Earth. One of the lessons I took from N was that each person’s choices to how they handle their illness, life and death is ultimately their choice! And the best way I could help N was not to try to save him with all the ideas, information and knowledge that I possessed but rather to love him and accept him fully where he was at even though he chose a different way to handle his disease than I thought I would have chosen for myself in the same situation. I learned that this kind of all purpose accepting love would break my heart open to grow even bigger. The other teacher I’ll call “I”. “I” had beaten non-Hodgkin Lymphoma 11 years prior to when I met him. A year later a cancer came raging back that was not Hodgkin. My friend “I” handled his prognosis in a way that I will always hope that I would follow if God forbid I found myself in his situation. In the beginning, he held a large pot-luck party with friends and family to let them know about his diagnosis, the process and how he wished to have his time unfold with all of us along the way. He gave us all permission to have our feelings and to be there for him (if we chose to) in our own special way. Some cooked meals, some cleaned house, some took him to appointments. “I” definitely took the power out of his death sentence. His life and how he chose to handle his last years encouraged me to become the kind of person that I always hoped I could be. The last week on Earth, I picked him up from an appointment and we went for an early lunch at Magnolia Cafe with his constant companion of the oxygen tank. I was so grateful for our conversation about life, and what was on the other side. And he was able to shed some tears about the beauty of it all and also some pain and sadness. I’m so grateful that I was able to just be there and hold the space without interjecting myself. Who knows the whys and wherefores of this life that we are all living right now. We’re all really just doing the best we can as a result of the choices we’ve made up until now. I will tell you that, for me, I’ve learned that in illness, dying or death situations going fully into the love that you have in your heart and allowing it to break through the crusty constraints you’ve let settled around your heart is the way to peace. A warm kind of peace. Break through to the peace. Love will take you there.